I’m alive and kicking it in the garden. Wedding season is also in full swing, so it’s been busy! Since my herbs are just coming in out in the garden, I thought I’d share some very important uses for those herbs… booze! Whether you’ve got a big yard with a garden, or a windowsill planter, growing a little herb garden is pretty easy. But have you considered growing a cocktail herb garden? Here are four cocktail recipes for your basic herb garden that are perfect for summer patio parties, or enjoying a drink outside on your balcony. When it comes to cocktails, sage goes great with honey, citrus, and apple flavors. 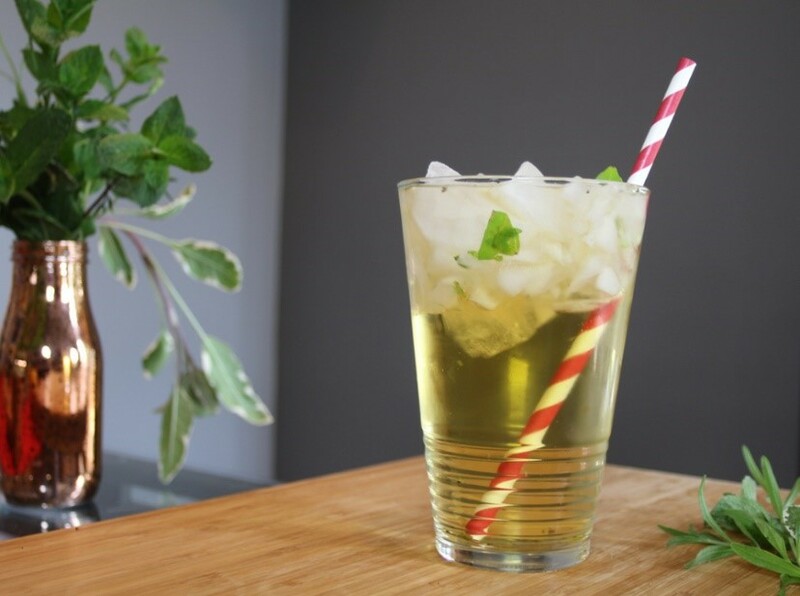 The Sage Summer Cooler pairs bourbon and honey with lemonade to bring out the flavor of your garden sage. A little bit of sparkling water or Sprite will give it that summery fizz, perfect for a hot day. 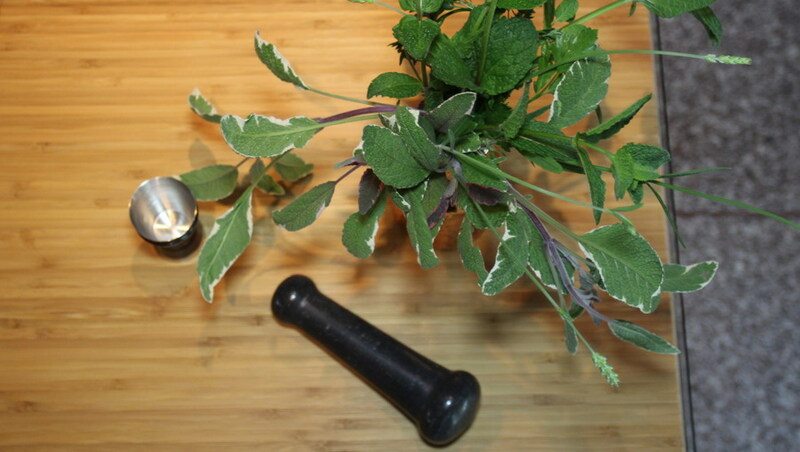 In this recipe, I used Tri-Color Sage, (because my garden has produced a LOT of it!) but any type of sage will do. The flowery St. Germain liquer pairs so well with any garden herb, that I find myself using it often in summer cocktails. Tear the sage leaves and drop them into your shaker. Muddle the leaves to bruise them and release the oils. Then add the honey. Fill the shaker with ice- about ¾ full, and then add bourbon, St. Germain, lemonade and sparkling water. Cover, and shake it good! Pour the entire contents of your mixture into a tall glass. 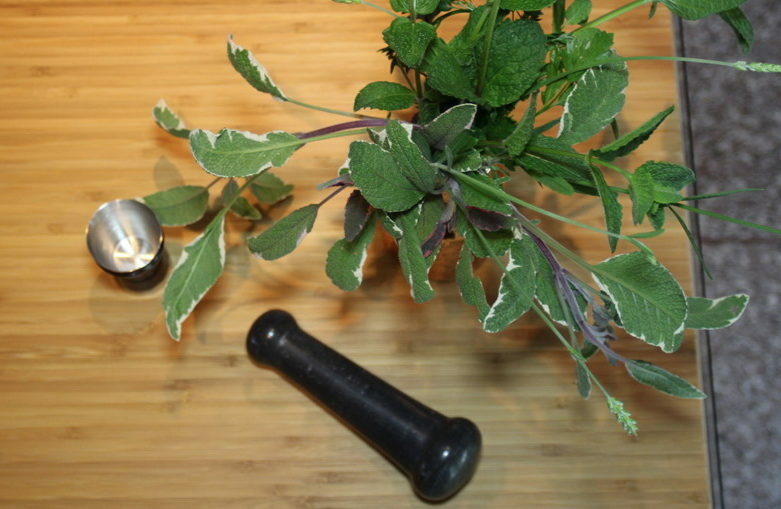 Garnish with a little sage and enjoy! Thyme is an aromatic herb that is very often used in Mediterranean cooking, and goes well with citrus, grapes, peaches, pears, and ginger. I used a white grape and apple juice for a mixture, but just white grape juice would work nicely. 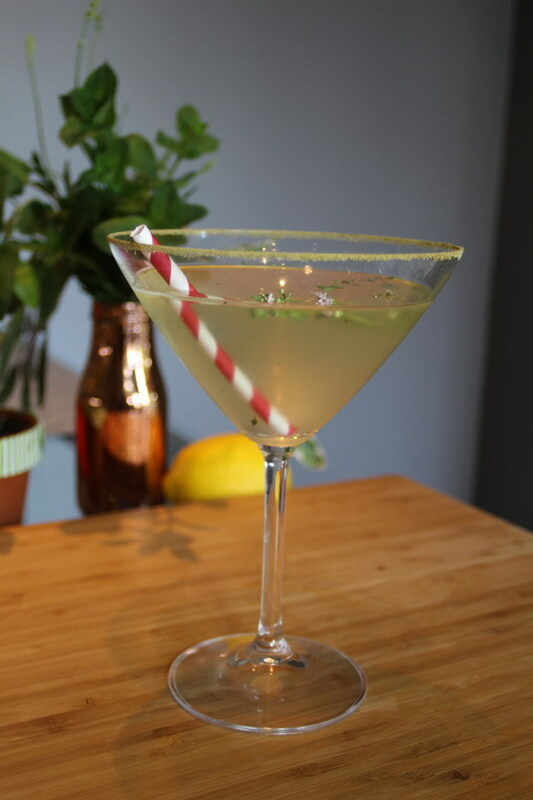 I also rimmed the martini glass with ground thyme – typically found at any store in the spice section. This added a LOT of Thyme flavor to the drink, so perhaps leave that out if it is too strong for you. Rim martini glass with ground thyme. To rim the martini glass: Moisten the rim of the glass by running a lime or lemon wedge around it. Shake ground thyme onto a small plate and dip the rim of the martini glass into the thyme. Remove thyme leaves from the stalk, and tear into pieces, then drop them into your shaker. Using a pinch of sugar, muddle the leaves to bruise them and release the oils. The sugar helps to bruise the leaves when muddling. Fill shaker ¾ full of ice. Add gin, white grape juice, and lemonade. Shake it up good. Use strainer to pour into martini glass, and garnish with a stalk of thyme. Enjoy! Basil might be one of the most-used herbs on the planet, but how often have you used it in a cocktail? Basil compliments a number of savory dishes, but also strawberries, watermelon, citrus, mango, mint, peaches, and plums. This Rum punch is a great warm-weather pleaser due to the tropical notes of the coconut and mango, and a little bit of fizz for refreshment. In a tall glass, tear basil leaves and add a pinch of sugar. Muddle basil and sugar to bruise the leaves and release the basil oil. Fill glass ½ full with ice. Add Rum shots, Peach Mango juice, and sparkling water. Stir well, then garnish with basil leaves. Enjoy your Basil Rum! It’s not often that you see rosemary in a cocktail other than a Bloody Mary. I set out to find other flavors that will work with rosemary, and found that apples, citrus, cranberry, peaches, and fig pair well. 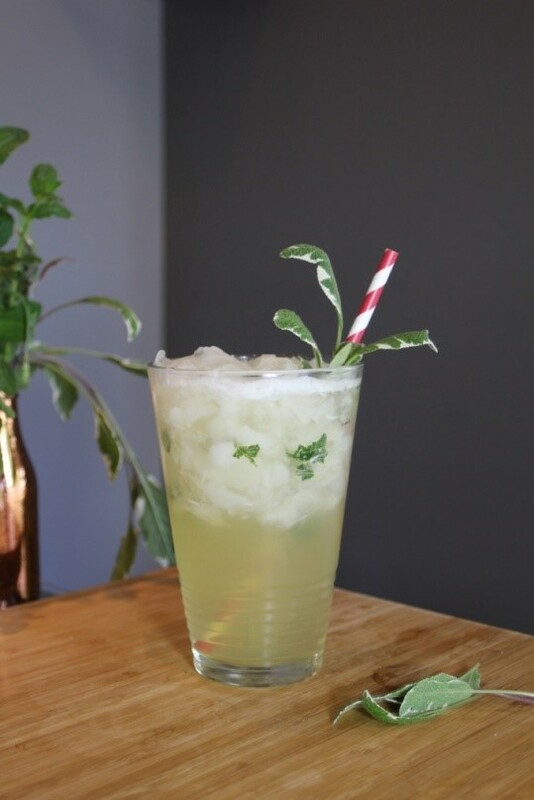 The Rosemary Fizz Cooler is a light cocktail for a hot day, and could easily be made as a large batch and served with a pitcher. 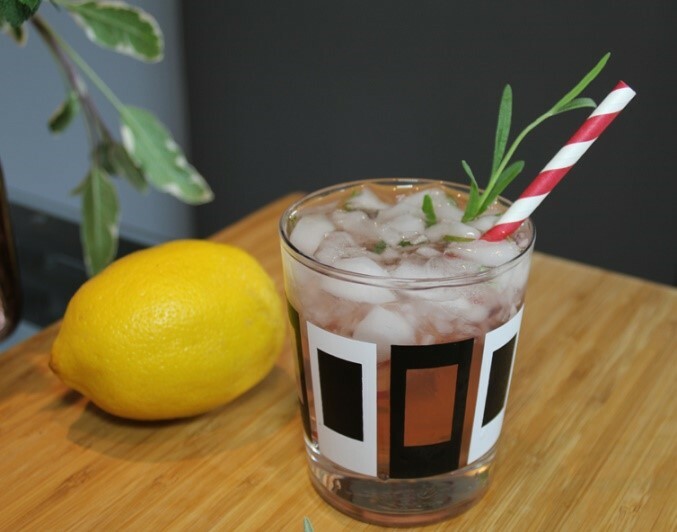 Tear rosemary leaves and drop into a tall glass with a pinch of sugar. Muddle the leaves and sugar to bring out the natural rosemary oils. Fill glass ½ full of ice. Add gin, sparkling water, cranberry juice, and splash of lemonade. Stir well, and garnish with a rosemary sprig. Sage, thyme, basil, and rosemary are all relatively easy herbs to grow, but almost all of them need full sun and frequent watering. Stay on top of your garden’s care, and you’ll be able to impress your friends with these fresh cocktails all summer long! ← Our Work Was Just Published….